Since 2015 not only have more people started depending on mobile devices, but they’ve also started using multiple ones to complete their purchase journey. As this happens a person’s Local Pack and algorithms will change, especially regarding their proximity to the business’ location. Having NAP consistency is important to both humans and Google here. 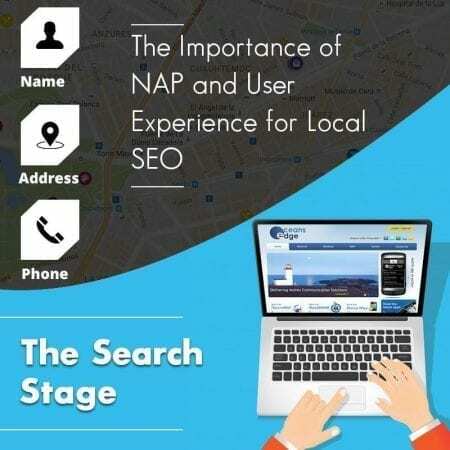 This part of the local SEO journey is vital because about 78% of those who start it will end up visiting a brick and mortar business within 24 hours – why NAP consistency and correctness are so vital. When someone performs their first search you want to make a great impression on them by providing value and information they’re searching for. This is why Google frowns on doorway pages (thin pages that only exist to help you rank better in the SERPs) today. Instead, you should create good local value pages, especially if you’re selling intangible products or don’t have a local focus. As you create content here, remember to make sure the main content reflects what you’re selling. Use supporting content to provide value and relevance, especially regarding your location. This is one of the main reasons why NAP consistency is so important today for both search engines and their users too. Regardless of how these inconsistencies and inaccuracies come about (e.g. human error, changing addresses, generating different phone numbers), they’ll result in frustrations and lost leads. Directories: While using different phone numbers for each directory can help you track your marketing efforts and their ROI, they do create a lot of inconsistencies in your NAP. Since this is the information directories use to create additional Google My Business listings for you, there will be lots of different phone numbers and map pin locations created too. All this results in a poor user experience since they now have multiple addresses available but only one of them is the correct address. Spam marketing: You aren’t the only one who doesn’t like getting phone calls from telemarketers. Businesses hate them just as much as you do. Unfortunately, using false phone numbers for marketing and local SEO purposes is no longer something you can do. Of course, false numbers are still a great way to avoid spam calls, it also prevents you from receiving calls from your genuine customers too. This is just one of the many ways in which some of the things you do for SEO can backfire as they negatively affect your customers and impede upon the type of experience they’ll have with your business. This is the best way to get higher conversions because customers who engage in this process typically want a local product and they’re prepared to buy it soon. Unfortunately, many businesses don’t take full advantage of the opportunities here. This is one area in which you can shine though, with a little help from Local SEO Tampa Company so contact them today.